Click to enlarge. 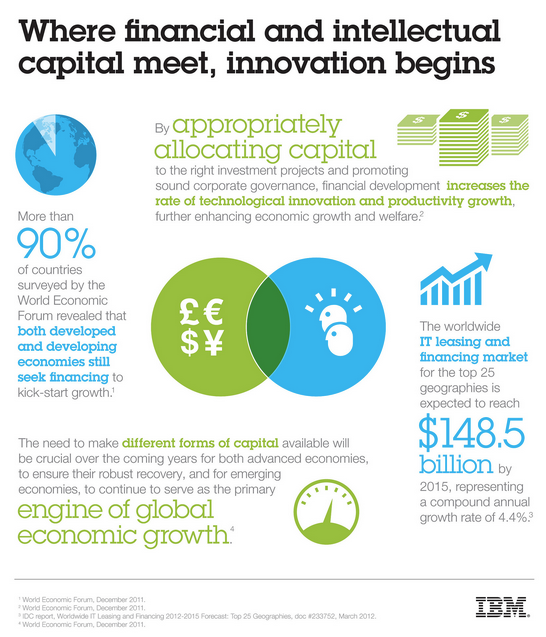 As the graphic itself explains, innovation starts with appropriately allocated capital. By investing in the right projects and by promoting sound corporate governance, financial development helps increase the rate of technological innovation and productivity growth. IBM today announced a major new financing program today that helps IBM Business Partners and their clients make such investments. Hello there. I’m back in Austin, Texas, and no worse for the wear. Las Vegas was…well, Las Vegas. Although I must say, I was most impressed with Wynn Las Vegas. Steve Wynn has been a lightning rod of controversy during his reign as a resort mogul in Las Vegas (and, now, Macau), and having only seen him in interviews on “60 Minutes,” I can’t say as I had much of an opinion one way or the other. But, after staying at his 60+ story hotel on the Strip these past few days, I can attest to the level of personal detail and attention he puts into his properties. Upon arrival on Sunday, I waited a good 30 minutes just to check in. But, upon reflection, I guess that’s a good sign for Mr. Wynn and his couterie, and they were kind enough to bring me a bottle of water to myself and other customers who were patiently waiting. But if hotels can do such a great job of enabling a streamlined checkout (video, phone check out, express checkout, etc. ), there’s clearly still room for much improvement on better “processing” customers when they arrive. Smarter check-in, anybody? But all in all, very impressed with the Wynn brand experience. As for the Word of Mouth Marketing Association Summit, I’m still processing all the great info I took in, and may dedicate a more thoughtful post on my experience about that later. But, since I was pre-occupied for a few days, we’ve had some important IBM news that fell below my blogging radar. The most notable announcement emerged earlier today, one for IBM Business Partners and their clients. IBM announced today it is providing IBM Business Partners with $4 billion in financing for credit-qualified clients over a period of 12 months. This financing, through IBM Global Financing, can make obtaining credit easier and more accessible to IBM’s global partner ecosystem and their clients to acquire advanced technologies such as cloud, analytics and PureSystems. Also, IBM is launching a new mobile app as another step to simplify the way IBM’s Business Partners can apply for and secure financing for their clients within minutes via any mobile device. This financing initiative builds on the $1 billion in financing IBM Global Financing made available through IBM Business Partners for small and midsized businesses in 2011, which resulted in 6,800 global companies using financing and enabling them to invest in some of these important emerging technologies. To learn more, you can visit IBM Global Financing here. IBM has made a series of important cloud computing announcements this year, including advancements to the IBM SmartCloud portfolio, through which IBM now manages 1+ million enterprise application users, and over $100 billion commerce transactions per year. In today’s announcement, IBM is broadening its cloud reach by extending its solutions and services on IBM SmartCloud and PureSystems to Managed Service Providers (MSPs). Some big cloud news has just hovered over the IBM horizon. Big! As in big, fluffy, floating cotton cumulus kinda clouds. Only, we’re talking about the IT kind of cloud, not the real clouds. Today, IBM announced a broad set of global initiatives to better position clients to take advantage of cloud opportunities. Aimed at further expanding IBM’s cloud ecosystem, this effort is intended to enable organizations to develop solutions and services on IBM SmartCloud and PureSystems, built on open standards. As more clients embrace cloud computing, they are looking to local technology providers known as Managed Service Providers (MSP) to help them quickly develop cloud based services in a more simplistic, secure and economical way. Managed service providers deliver a defined set of technology solutions or services to clients with a pay-as-you-go model. MSPs are largely leveraged by customers which want to take advantage of cloud technologies but lack the internal IT skills, resources and time. As part of today’s news, IBM is taking its collaboration with MSPs and its global ecosystem one step further by enabling them to build innovative solutions and services on IBM’s advanced technologies such as SmartCloud, PureSystems, and analytics. IBM will also provide MSPs access to IBM experts with deep technical skills at four new global centers of excellence; and offer an unmatched set of programs to support MSP marketing efforts to help them build their brands, generate demand for their services, and grow their marketing skills. Additionally, IBM will offer affordable financing options through IBM Global Financing to help MSPs acquire new technologies. Access to Global Centers of Excellence: IBM is launching new Global Centers of Excellence in Shanghai; Tokyo; Ehningen, Germany; and New York City to provide MSPs with access to IBM’s deep technical expertise to develop innovative cloud services and solutions on IBM’s open stack to address industry-specific client needs. This will enable MSPs to get hands-on technical expertise in building skills on technologies such as IBM SmartCloud, PureSystems, storage, security and collaboration. MSPs will also have access to IBM’s 40 IBM Innovation Centers in 33 countries for joint client engagements. In addition, IBM will launch a virtual briefing center that will provide an ongoing forum for MSPs to share ideas and knowledge around industry challenges clients are facing today. This community will enable ongoing engagement of MSPs as well as IBM experts to share best practices. Dedicated Marketing and Sales Support: IBM will now offer an unmatched set of marketing and sales support initiatives tailored to MSPs. These initiatives are designed to help MSPs grow their businesses, build their brands and create demand for their capabilities. The new program will provide MSPs with solutions for building a complete marketing plan and a four-part education effort on how to effectively use social media to grow their businesses and better target their clients. Additionally, MSPs will gain access to IBM analytics capabilities to help them identify new customers and capture additional opportunities with their existing customers. As part of the program, MSPs will also receive dedicated support from IBM to guide them through the program and take advantage of the resources made available. A significant part of the $100 million IBM has invested annually in marketing efforts for its global ecosystem will now be made available to MSPs and their marketing efforts. Seizing the Opportunity with PureSystems: PureSystems will provide a new, integrated, by-design platform for MSPs to tune hardware and software resources for data intensive workloads. The integration of the PureSystems platform, coupled with the patterns of expertise technology and the flexibility to configure an application for either an on-premise or hosted environment, makes the PureSystems platform a natural choice for MSPs. Building on the Advanced Capabilities of IBM SmartCloud: MSPs can take advantage of IBM’s SmartCloud, including an option to integrate the offering as an IBM-backed solution or under their own brand in the market built on IBM SmartCloud Enterprise to expand the services they offer. IBM will also work with new MSPs to design and develop their data center strategies, leveraging IBM’s years of experience in data center best practices. Financing Options through IBM Global Financing (IGF): MSPs can acquire new technology solutions and services to support their growth with flexible, affordable payment plans for IBM systems, software and services — including 12-month, 0% loans for IBM Systems, Storage and Software. A payment plan from IGF can provide MSPs with low monthly payment options while avoiding large, up-front cash payments, the ability to upgrade their systems mid-lease and improve IT asset management. MSPs that select PureSystems platforms may defer their first payment for 90 days. Members of IBM’s ecosystem, which includes independent software vendors, systems integrators, value-added resellers, and MSPs are collaborating with IBM to take advantage of IBM’s higher value capabilities such as SmartCloud, PureSystems and analytics to build industry specific cloud services. Additionally, IBM Business Partner Perimeter E-Security, based in Milford, CT, is collaborating with IBM to address the increasing cost, complexity, and stringent compliance requirements associated with securing communications and infrastructure in information intensive businesses such as banking, healthcare, and government. Solving today’s regulatory and security challenges has and continues to become more and more cost prohibitive. While smaller financial institutions face the same regulatory pressure and data security threats, they lack the resources larger banks have to secure their institution. Cloud technology is now making it possible for smaller banks to address these issues cost effectively. This collaboration complements Perimeter’s capabilities with advanced technologies such as IBM SmartCloud, storage, and security capabilities, as well as expanding the MSP’s global presence in growth markets such as Africa. The new offerings, which range from developing skills to gaining access to IBM’s R&D and Innovation Centers, are another proof point of IBM’s focus on providing the right capabilities and expertise to help MSPs fulfill the evolving needs of today’s clients and, in turn, help MSPs grow their own business. Today’s news builds on IBM’s recently announced sponsorship of the new OpenStack Foundation, an independent entity, to promote the project and open source cloud computing. 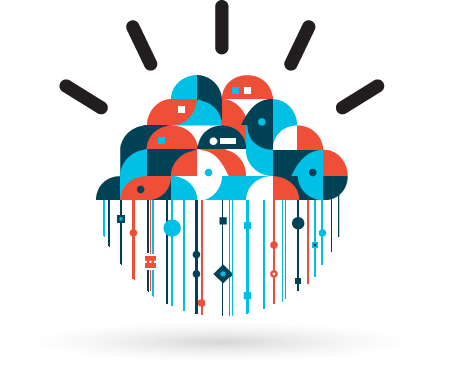 OpenStack will enhance IBM’s SmartCloud Foundation offerings, drive deeper industry collaboration and accelerate momentum for critical industry standards while also making it easier for MSPs to consume IBM’s offerings through the Cloud. You can learn more about IBM cloud computing initiatives here, and follow Managed Service Provider communications from IBM on Twitter using the hashtag #ibmmsp. It’s snowing in Toronto today. And I mean, like, really, really snowing. Like it apparently hasn’t snowed all winter. 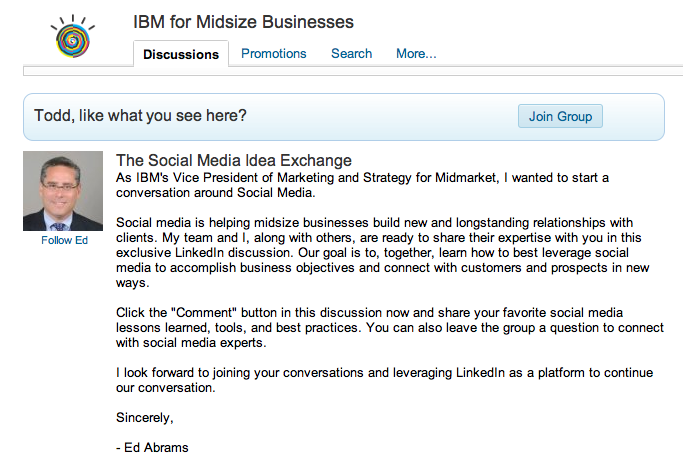 Ed Abrams, vice president of IBM's midmarket business, leads a discussion on LinkedIn about the use of social media by small and medium-sized businesses. I’ve very much enjoyed my two days on the ground here thus far — the team has been most gracious and I’ve learned more than I can process about our live chat operations (no, not THAT kind of chat!). The kind where we help you buy the stuff you’re looking for! And on the help front, I wanted to share some news coming out of the IBM PartnerWorld event taking place in New Orleans this week. Today, IBM announced the expansion of a global skills initiative to educate clients and business partners on social media tools and techniques to showcase expertise and create new business opportunities. With today’s news, IBM is further investing in its clients and business partners across the world including emerging markets such as China, Australia and Saudi Arabia to develop the skills that will enable them to sharpen their social networking capabilities to build even stronger and more interactive ties with their clients. The IBM eight week social media boot camp is available to IBM business partners to provide the education and skills necessary to successfully engage in social media and begin driving the conversation around their brand. This initiative provides IBM business partners and clients access to one-on-one social media coaches who set measurable goals for building and exercising social acumen. The customized curriculum is designed for organizations to become more comfortable and effective in their marketing and sales efforts. By using social networking tools and techniques participants learn to integrate social media into their daily business activities. IBM Business Partner Starfire Technologies, Inc. was among the first organizations to enroll in IBM’s Social Media Boot Camp. Prior to the program, Starfire’s use of social media channels was limited. After enrolling in the eight week social skills program, Starfire is now leveraging social channels to re-architect the way it does business. For example, as a result the tools and techniques offered by the Social Media Boot Camp, Starfire is reconstructing its company website, integrating social media tools and platforms to best interact with customers. The organization has transformed its business strategy by extending its reach through the social networks to create significant interactions and two-way conversations with its customers. To join in the conversation around IBM’s Social Media Boot Camps, visit LinkedIn. It was on this day in 1845 that Texas officially became the 28th state in the United States of America. But, Texas is NOT where I’ll be in a short couple of weeks. No, instead, I’ll be visiting the 27th state admitted to the United States of America. Any guesses on what the 27th state was? Click to enlarge. At IBM Connect on January 16-17, 2012, in Orlando, Florida, discuss the why, what, and how of using social, mobile, and cloud technologies to meet common business challenges and to enable people to improve their business performance. IBM Connect registration fee includes access to IBM Connect 2012 keynotes and breakout sessions, dining, a Solutions Center, and two exclusive evening events. Lotusphere, to be more precise. And IBM Connect @ Lotusphere, to be perfectly precise. I’ll be making my third return trip to Lotusphere, and I couldn’t be more excited. Though I’ll be leaving Scott Laningham behind to cover the podcasting front remotely, I’ll be there in full regalia, and attending a number of the IBM Connect sessions. If you’ve not heard of IBM Connect, think of it as a conference-within-a-conference for those forward-thinking business leaders who want to learn how to turn the opportunity that comes from becoming a social business into measurable business success. At IBM Connect, C-level executives and business leaders from a wide range of disciplines — product development, R&D, marketing, sales, customer service, HR, corporate communications, and IT — and from a diversity of organizations around the globe will come together to discuss the why, what, and how of using social, mobile, and cloud technologies to meet their business challenges and to enable people to improve their business performance. 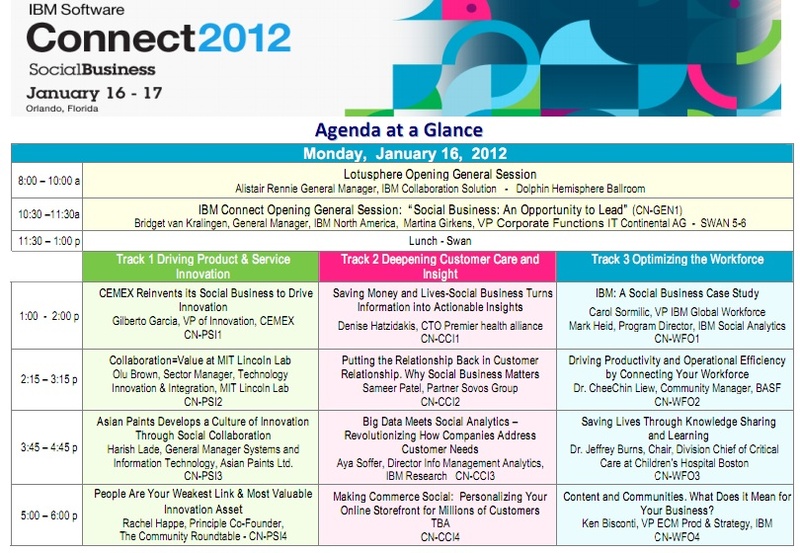 I’ve included a snapshot of the sessions from Day 1 of IBM Connect (see above), but in the meantime, you can go here to learn more about the event and to register. 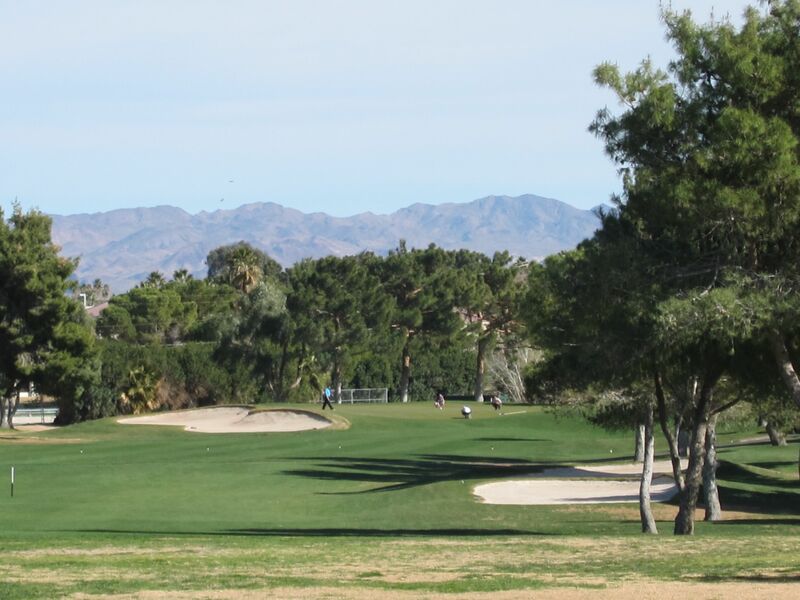 Leading up to and during the event, stay turned to the Turbo blog for full coverage and highlights from both Lotusphere and IBM Connect 2012.